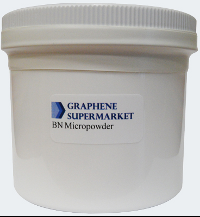 BN Micropowder is useful for creating BN solutions with applications ranging from electronics to energy storage. The powder may be sonicated in a range of liquid solvents, whereas the longer sonication takes place, the smaller the flake size in solution. Further, before sonication the solution will be white, and after it will turn a milky-white. The solvents useful during sonication include chloroform, bromobenzene, isopropanol, formamide, and many others. The liquid dispersion may then be used to create a thin film on the substrate of your choosing. These thin-films have a range of applications, such as transistors, solar cells, and energy storage devices. BN solution can also be used in composite materials. The difference between our micropowders and ultrafine powders are their flake sizes. Ultrafine powders have smaller flakes, and create dispersions with smaller particle sizes after sonication than micropowder. Micropowders require more sonication and will result in flakes with larger lateral dimensions. Micropowder is a low-cost alternative to our ultrafine powder.